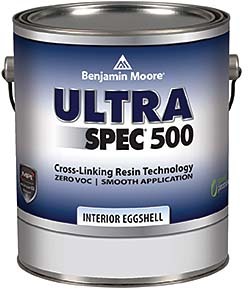 Ultra Spec 500 interior paint incorporates a zero-VOC waterborne colorant system. Cross-linking resin technology extends the life of the coating. Recommended for interior wall and ceiling surfaces or on primed or previously painted drywall, plaster, wood, metal and wallpapered surfaces. Available in flat, low sheen, eggshell, semi-gloss and gloss finishes.